Cooking and cleaning in the kitchen is plenty of work as it is — why not make your life a little bit easier with any (or all!) of these ingenious kitchen features? Whether you want to simplify or organize, these 10 ideas are something to get excited about. 1. A Pot Filler — This unexpected but fairly simple kitchen feature (see on here) can make filling that large soup or spaghetti spot a task of ease. Rather than carrying your heavy pot of water from the sink (where it might not even fit anyway), have a fold-out faucet (connected to a cold water line) mounted into your backsplash over the stove. Fill the pot right where you need to use it — voila! 2. Cabinet Pull-outs & Drawers — If kitchen cabinet space is hard to come by, make the most of your layout by utilizing storage features that pull out, spin, or expand. 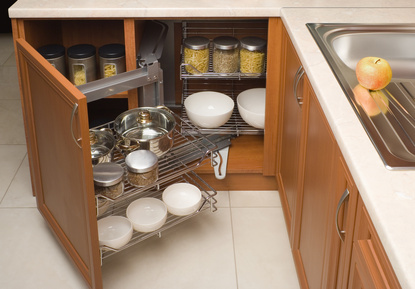 Using sliding trays in your cabinets can make the back items reachable, while adding deep drawers to your cabinetry is a great fit for pots & pans. Including a lazy-susan, or any number or wire pull-out features, can help you utilize space that might otherwise be wasted. 3. A Coffee Bar — Why run all over the kitchen for your morning coffee when you can keep everything in one place. Select an ideal space from what you have now, or include a cubby and a countertop surface just for this when you remodel. Keeping the mircrowave, coffee maker, cups, flavorings, and add-ins all in one place will give you that coffee shop vibe each morning. Take a peak at this one. 4. The Countertop Garage — A countertop garage is a great way to house a machine you use semi-regularly but don’t always want in plain sight. At countertop level, but hidden within your cabinetry, most will utilize a roll-up door closes to hide your mixer, toaster, or blender, leaving counter space in front for other uses. 5. A Utensil Rack — An inexpensive but handy feature, utensil racks hang from a cabinet or along a wall. Usually a metal bar with hooks, you can make a fun display hanging an assortment of often-used tools within reach! 6. Home Headquarters — Let’s face it, life needs it’s own office, and the kitchen is just the place. Carve out a space for a built-in desk area with cabinetry on top, giving you multi-purpose surface and storage. Better yet, hang (or store) an i-pad or small TV in the area for easy access to the morning news or that great recipe app. Find some ideas from houzz.com here. 7. A Recycling Hub — Tired of cans and boxes piling up on the counter or floor? Make life simpler by planning out a handy trash and recycling area. Whether you choose to put it under the sink, in a pantry, or in a pull-out cabinet, keep convenience in mind, as you’ll use this feature every day. 8. Hidden Outlets — Never finding kitchen outlets right where you need them? Don’t want them to be an eye-sore in your backsplash? Add some when you remodel or build your new home. Whether they’re built in to the under-layer of the cabinets above, or configured as a hidden pop-up system in the countertop, this is a cool feature you’ll quickly come to rely on. Have a look at these. 9. Pull-out Spice Cabinets — Have an extra 6” to spare? You’ll want one of these narrow, pull-out cabinets jam-packed with mini shelves, just ready and waiting for your spices, oils, and more. Check out a few of them here. 10. A Pet Station — If you have animal food dishes lying around, this is one ingenious idea for you. Rather than letting those pet bowls get under foot, build in a station that supports the bowls and offers storage for treats and more. Often the side of a kitchen island is the perfect fit, but a pull-out drawer system can work well too. Take a look at ideas here. Ready to create a kitchen with features that will simplify your life? Big updates or small, we’re ready to help! Connect with us here at Andrus Built today and let’s chat about your building or remodeling project! Serving St Paul and the surrounding Twin Cities / Minneapolis area.